Nuts are not only my go-to snack but also such a game changer in salads and as a garnish for many dishes as well as in pesto-like sauces, curries, etc. And my supposedly nut-averse husband now loves them in salads (though not yet in cookies!). I typically stock roasted, unsalted peanuts, raw almonds, hazelnuts and walnuts. You can make your own nut butters in the food processor if you want to make peanut sauce but are out of peanut butter but have peanuts. To toast nuts, spread them on a baking sheet and toast them in a 300 degree oven for 10-20 minutes, depending on size/type until they smell nice and toasty and are a shade darker. Cook completely and store in an airtight container for up to a few weeks. I use toasted, chopped nuts in green salads, in Asian-style noodle salads, in fried rice or in this vegetable korma. 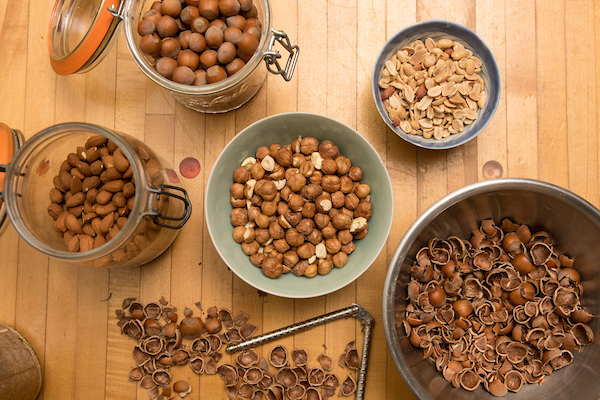 I use nuts in pestos and sauces and use almonds, hazelnuts and walnuts for those typically. I rarely have pine nuts on hand–the classic nut for pesto–since they’re so expensive and don’t keep well. The delicious Spanish romesco sauce uses almonds to thicken and flavor it, usually calling for blanched almonds. You can skip this step with fine results or you can drop raw almonds into boiling water for just 60 seconds, then drain, cool and dry and remove skins, and proceed with recipe.